Loaded with flavor, this meal is not only easy to make but totally satisfying to eat. Make it this week for dinner! Slice sausage into quarter inch rounds. Add to the slow cooker. Add in the diced bell pepper, sliced mushrooms, diced tomatoes, minced garlic, basil, onion powder, parsley, oregano, salt and pepper. 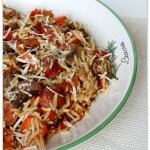 Cook the dried orzo on the stove top according to package directions. Drain off the water and stir into the slow cooker. Stir in the Parmesan cheese and serve.